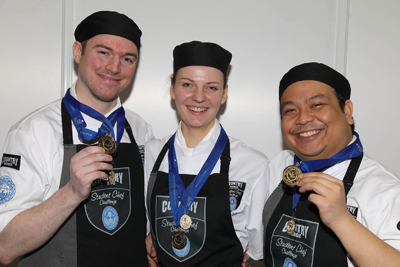 City of Glasgow College wins Country Range Student Chef Challenge again! The winners of the 25th Country Range Student Chef Challenge at ScotHot were three cookery students from the City of Glasgow College – the second year running that the college has taken the title. The winning students from City of Glasgow College. Alan Coats, Ance Kristone and Andreau Talla fought off competition from seven other teams to win over the judges, who included members of the Craft Guild of Chefs. Loughborough College came second and Carlisle College third. The City of Glasgow College team was said to have “showcased supreme skill and precision, as well as high-quality flavour and presentation”. The prize includes work experience at a Michelin-starred restaurant and a ‘foodie tour of London’. The winning menu featured a starter of seared sea bass, charred & pickled turnip, turnip tops, Malaysian coconut & peanut curry and garlic crisps; main of roast duck breast, glazed duck leg, duck ‘bacon’, caramelised onion, Jerusalem artichoke, cabbage and brown sauce; and dessert of chocolate tart, caramelised banana, pecan crisp, salted popcorn and popcorn sorbet.